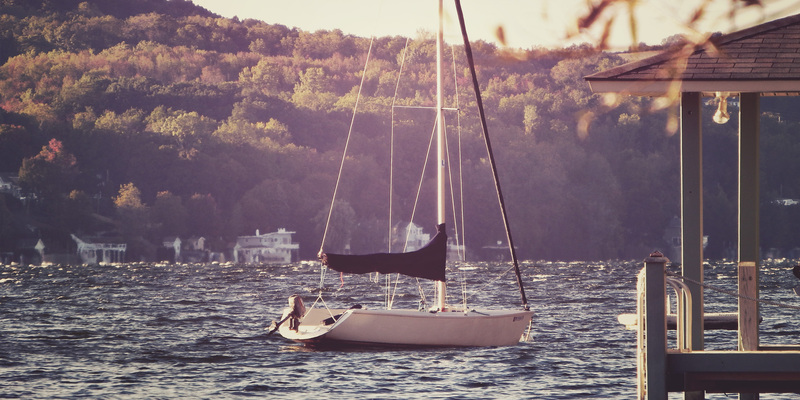 Located on the eastern shoreline of Canandaigua Lake, Crystal Beach and adjacent Cottage City have always been historic areas. The flats east of Cottage City was the site of a Seneca Indian camp in previous centuries. Development really began here in 1878 when Richard M. Gage built the first cottage. By the early 1890’s many Rochester visitors were building summer cottages here. Gage opened the Cottage City House in 1898. Cottage City and Lincoln Wood to the north were important steamboat stops. The area now known as Crystal Beach was a large grape farm owned by the Washburn family. In the spring of 1929 Paul Ritchie purchased the Washburn Farm, and his Finger Lakes Company began developing Crystal Beach at the same location. They laid out the grid of roads, reserved areas for parks, and subdivided the area into 965 30 foot by 80 foot lots. Included in the parks plan are 3 right-of-ways to the lake, rights to which Richie included in the deeds of each lot. This was a very unusual thing to do, which years later we are very thankful for. Six months later, the Great Depression brought an end to the developers plans. So most of the cottages were built by the individual owners, not professional builders. Therefore, there is a lot of variation to the style and quality of the buildings. All content copyright 2019 by CBBA.